I have a three-drawer plastic container under my bathroom sink. 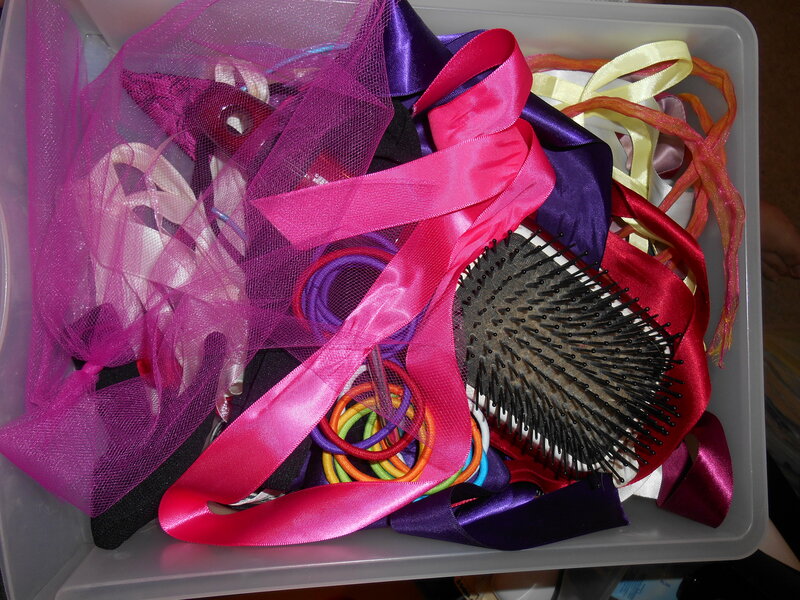 I used to keep hair decorations and makeup in it. I’ll get to the makeup drawer in a minute. 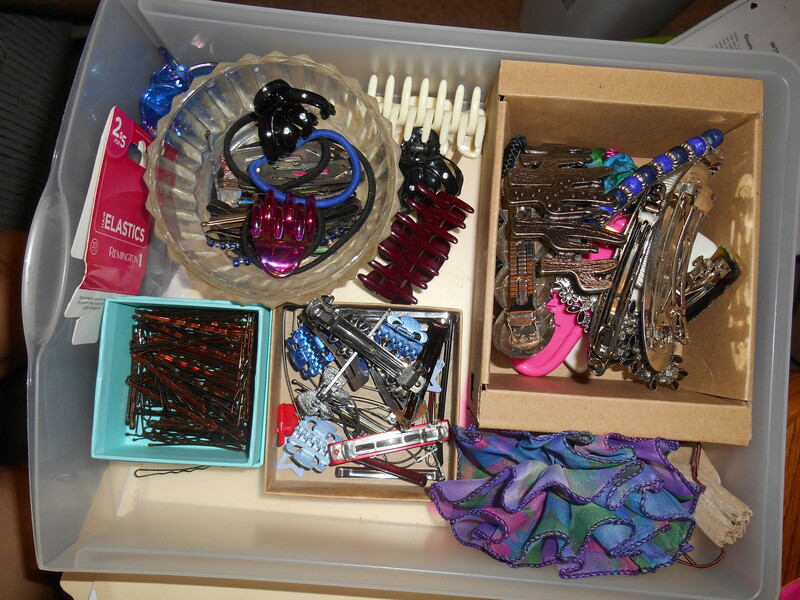 I offered to my mom pretty soon after I made these piles, and what she didn’t want I either threw away (bobby pins/small, deformed clips) or donated. I then combined the drawers, since I had less of everything. I’ll admit, it looks LESS organized now. But trust me – I’ll be more easily able to find things now. The place in the cabinet where this was was NOT helpful. 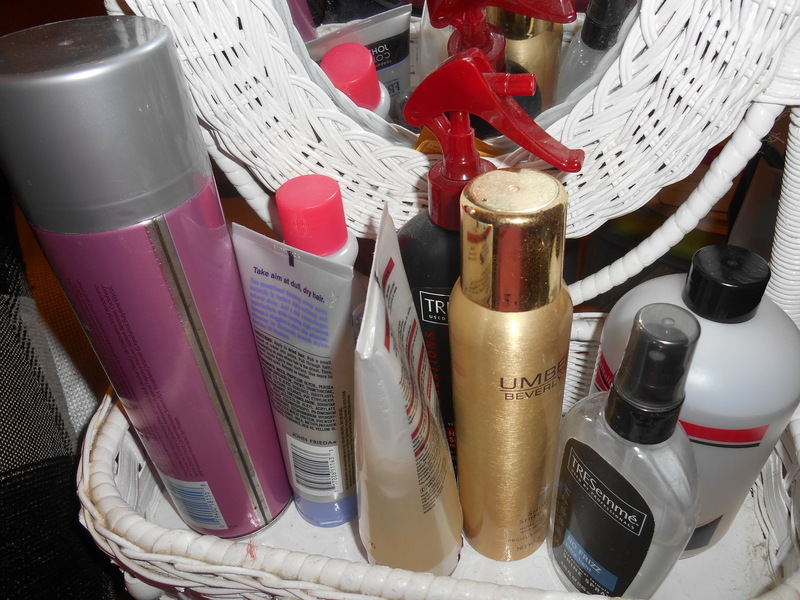 And I almost never style my hair, so some products were unnecessary and others need to be more readily available so I’ll REMEMBER to use them! 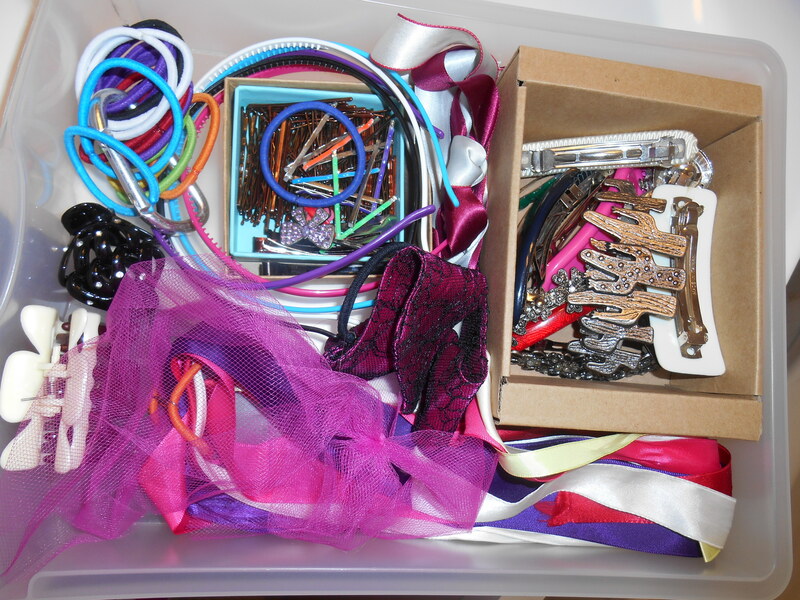 I also have my sporty-headbands in this drawer. 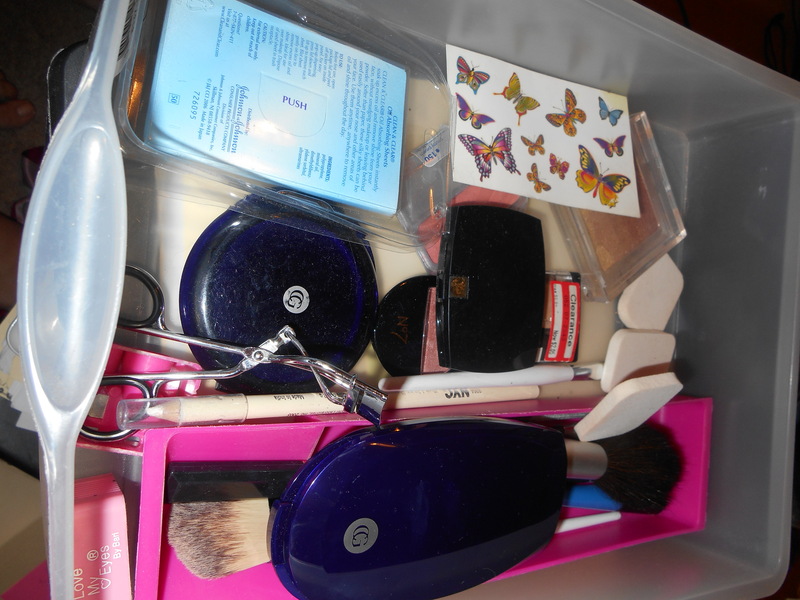 Bottom drawer used to be makeup… and other random stuff, apparently. Threw away every broken or super old makeup, the tattoos, the extra sponges (which I don’t use, I use a brush) and was left with virtually nothing. But that’s okay, because I rarely wear makeup. 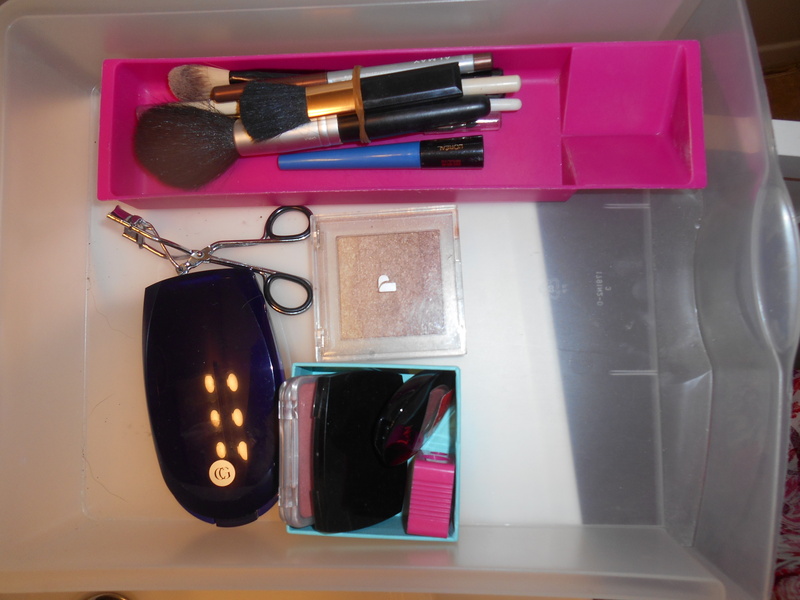 I plan on putting the brushes, mascara (not shown), and eyeliners – everything in the pink pencil holder – in a jar or something in my medicine cabinet. The eyeshadows, blushes, sharpeners, etc. will go in a travel makeup bag and live somewhere else so I can have another free drawer. Since doing this, I’ve used more hair decorations than I have in a while, because I remembered they exist! What’s under your bathroom sink? 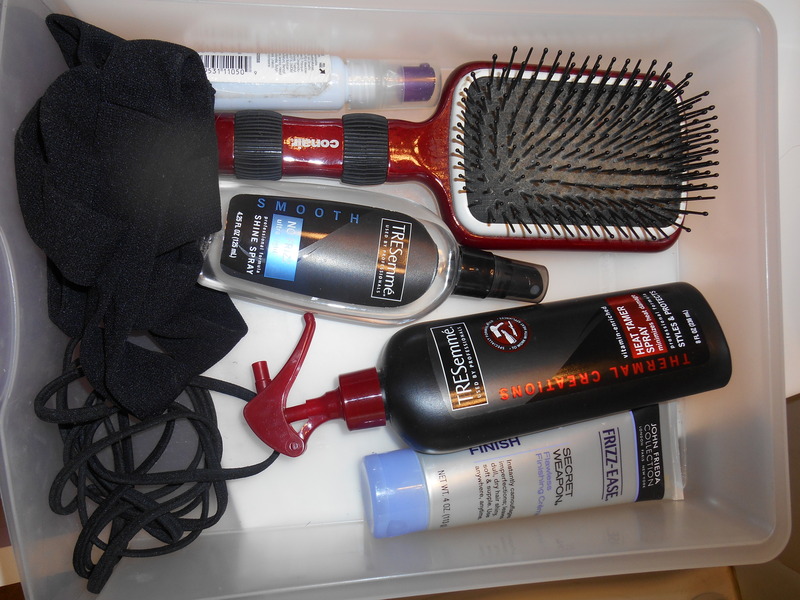 This entry was posted in Declutter, Organization and tagged barrettes, bathroom, bathroom sink, bobby pins, bottom drawer, clean, cleaning, declutter, drawers, hair decoration, hair decorations, hair products, headbands, makeup, organization, organize, organized, organizing, plastic storage, ponytail holders, small drawers, small plastic drawers, storage, top drawer, under sink. Bookmark the permalink. Hooray for getting rid of useless things in the hair/makeup area! I need to do that ASAP!! My drawers are overflowing with things I barely use. Under my bathroom sink there is a bunch of cleaning supplies, travel things and extra soap… not very exciting at all.